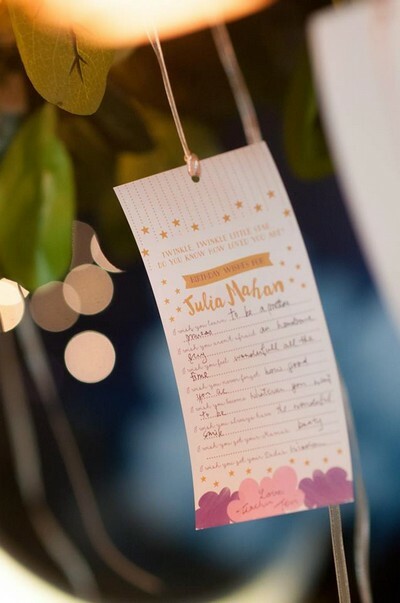 What I absolutely love about being an event stylist is the fact that I meet with clients at one of the happiest points in their lives: when they have their newborn baby. When you meet with people, there is an energy that you feel at the onset that you perceive through their actions, gestures, and body language. And what these convey to me is an overwhelming love for their child. I should know, because I have the two prettiest, most lovable, most cherished angels in my life. And, if you haven’t figured it out yet, the theme is Twinkle Star, and for me, one of Party Magic’s best work ever. And this is quite amazing really, when you consider that this wasn’t the first choice of theme. 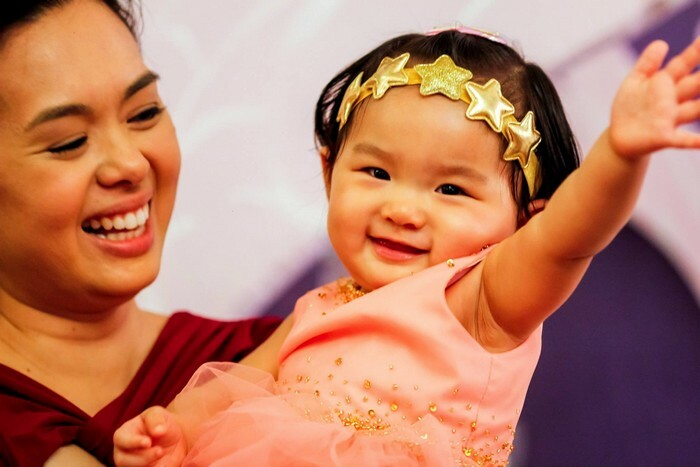 You see, when Mommy Audrey hired me, we were considering a different theme, somewhere along the lines of a garden or butterfly theme. However, once the Twinkle Star was proposed, we both fell in love with the concept, and never looked back since. The main concern of Audrey was that “Twinkle Star” might be too dark. Of course, when you think about stars, you think about seeing them on the night sky. And this is also where one’s imagination should step in. In fact, how can you create a whole party based on a single thing, such as a star? The answer to that is instead of boxing yourself into a single definition, focus on how open-ended the concept is. 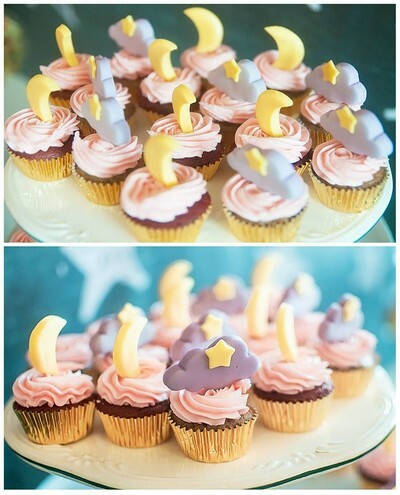 Stars mean clouds and the sky, and warm, glowing light, and the moon, and lamps and candles. 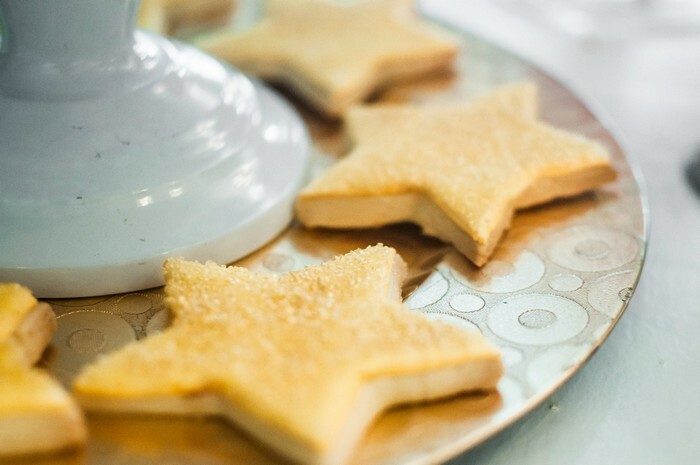 Read on below to see how everything turned out! The clouds both at the bottom and on top were covered in cotton to create a softer effect, and the flooring was covered in white fur carpeting, as if Julia is floating in the clouds! 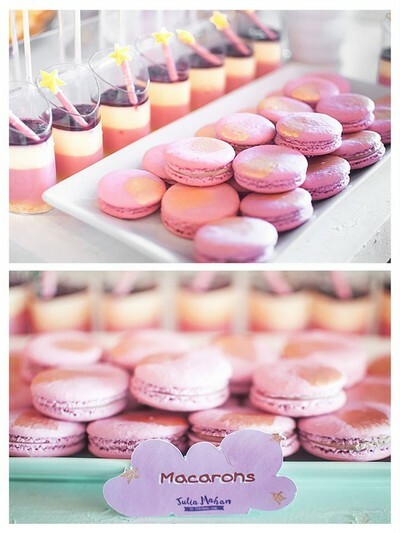 The cake is an absolute darling and complements the whole set-up. I think it is a wonderfully done ombre cake, complete with textured gold stars made as if they are “cascading” down the layer. 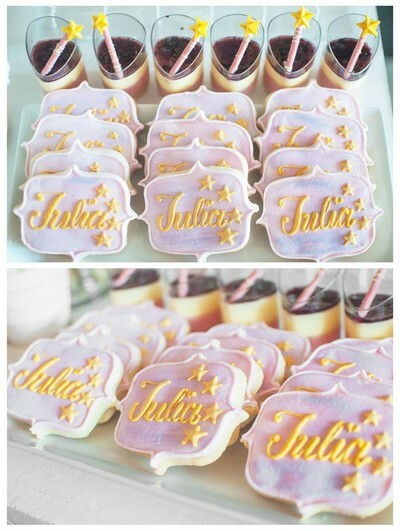 Done by the great Sugarplum Pastries! This is such a photogenic shot. Did you notice the background? 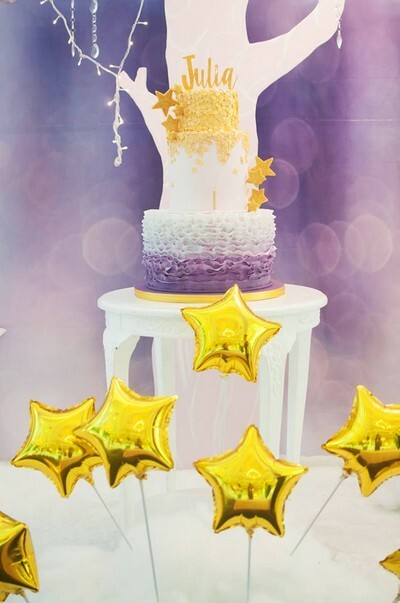 I thought that it would be nice to have some sort of translucent graphic, and this served to convey some sort of “motion” into the scene, as if droplets of shimmering stars are falling around the cake! I just love the Julia lettering. If you noticed, we did not use the typical block lettering displayed in front of the stage. I thought that it would be nice to have some stylized lettering on top of a crescent moon for a change. 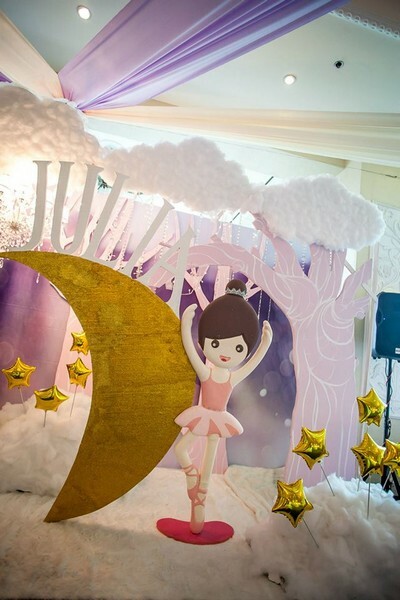 The ballerina is a total cutey, too! 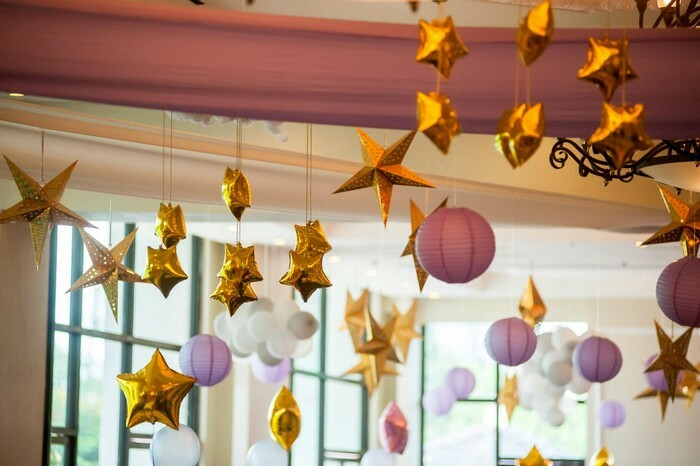 The ceiling was a muted combination of balloon-clouds, lavender lanterns, gold star mylar balloons, large gold star lanterns, and swags. Everybody had loads of fun with this set-up, because anybody can actually sit on the crescent moon! Isn’t that so awesome? The background was a starry night, with the stars as actual lights! 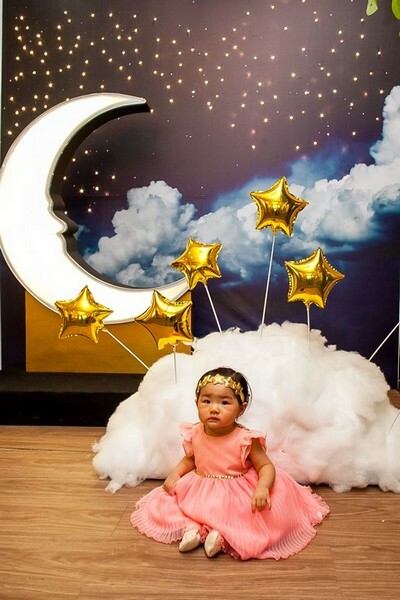 And this is the real money shot: baby Julia sitting on the moon, amongst the clouds! Talk about achieving a dreamy effect! Now on to the table setting. 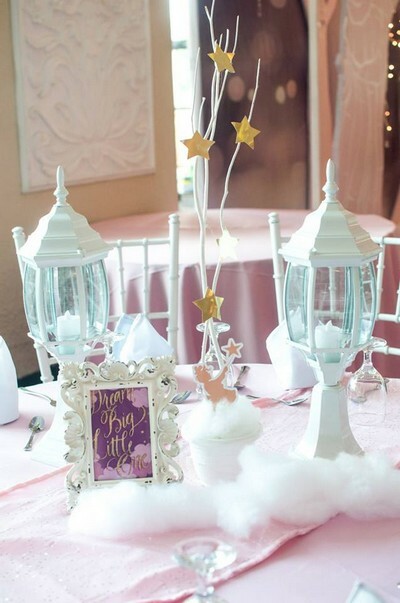 In line with the theme, we used lamps with candle lights inside, accented by a vintage frame and white branches on top of cloud-shaped cotton. 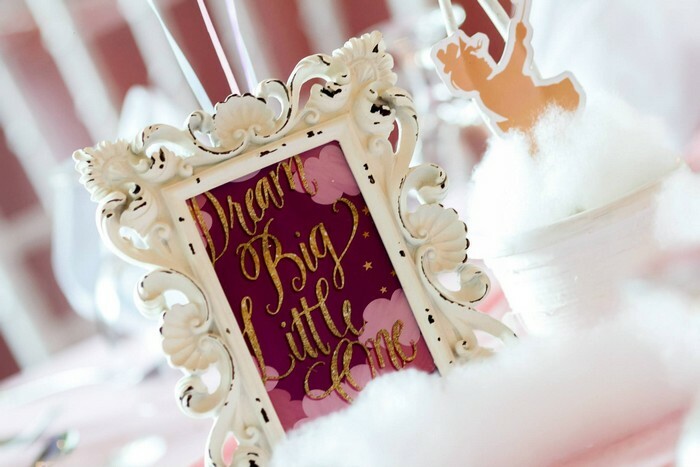 The frame is captioned with: “Dream Big, Little One”, which I think is so apt for how we parents feel about our children. The dessert spread was an absolute dream (no pun intended!). Thank you so much to the great Anthony Co for these breathtaking pictures! For more of his wonderful works, check out his website here. 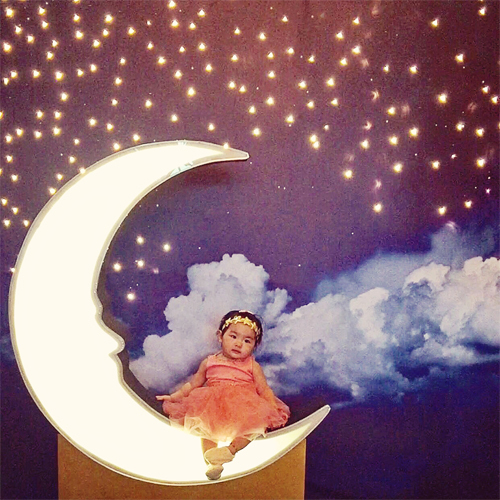 Twinkle on, little Julia. The happiest of birthdays to you! Ethan and Caden: A Robotic Rumble! 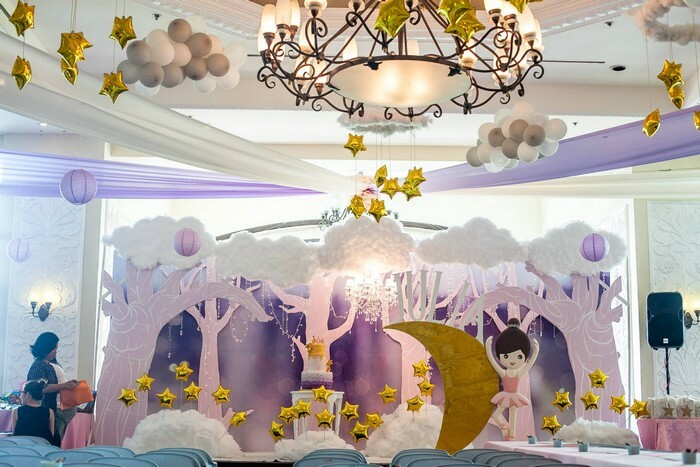 Thank you so much for creating this absolutely dreamy setup for Julia’s birthday party! I was smitten by the delicate and lovely details, but what completely blew me away was the stage. It looked…magical! I sat Julia on the stage, and while she normally wiggles about, she sat completely still that time, as if enchanted by the clouds and the star balloons. I was delighted to see her looking so enthralled. You’re a brilliant and creative artist, Michelle! 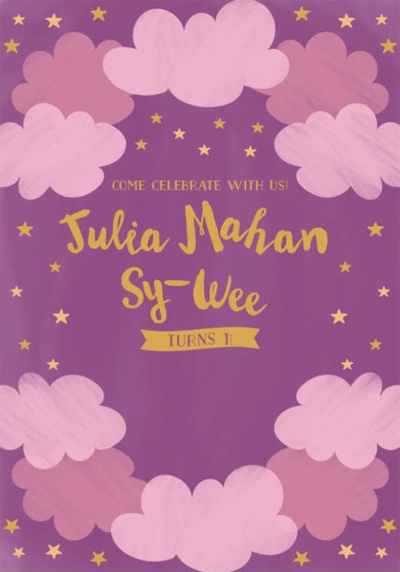 I have always loved reading your blog on the parties you’ve styled, so what a thrill to see Julia’s party among them :) Thank you! Thank you so so much for the kind words! 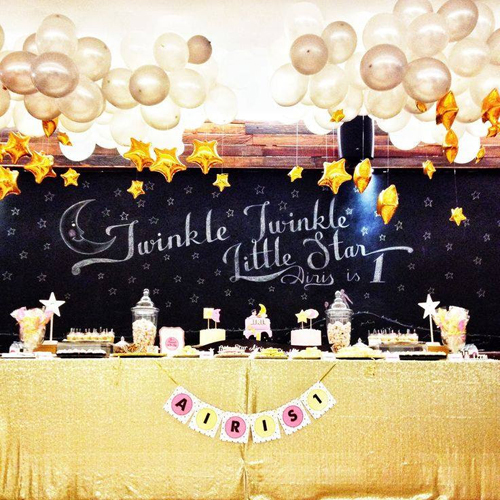 Parties like these and clients like you make me remember why I went into event styling in the first place. 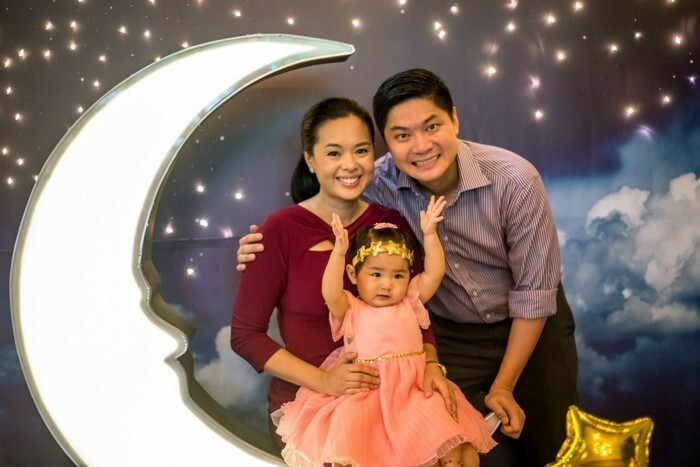 The most important thing for me and the Party Magic team is that you, Julia, and your family were happy with the decor! This is very nice! My daughter loves this song which i normally use when I’m putting her to sleep. Even when she’s grouchy, I just sing this song and this made her stop and smile and hum with me. ;-) I am actually looking for this kind of theme in the net and I’m lucky to discover your site. 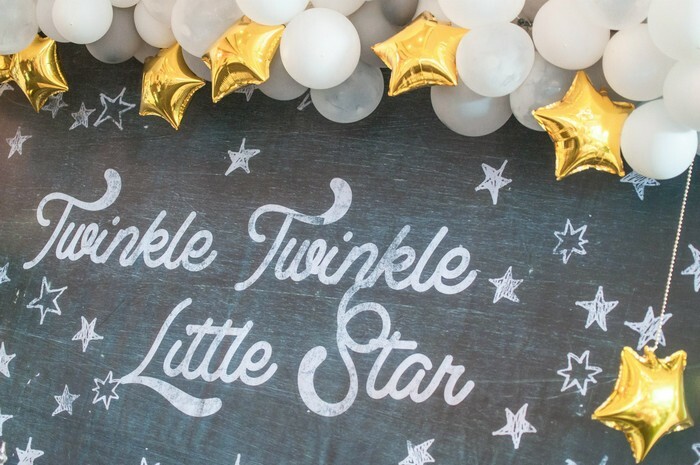 My Brianna is turning 1 in December and Twinkle Star is also the one in my mind. ;-) I just hope this is not veeerrryyy expensive! ;-p Great job you got there! Just want to inquire how much this kind of styling/setup cost. 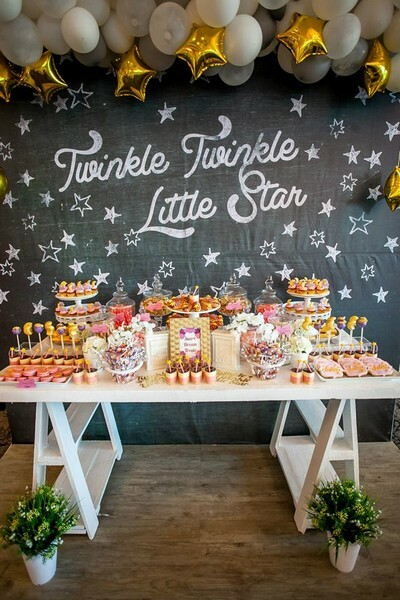 Pics are amazing and we also like to have a twinkle twinkle theme for my baby’s 1st birthday. 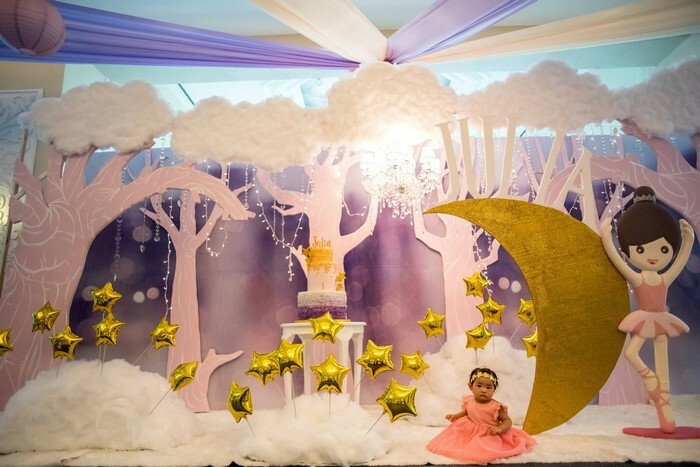 Hi Shiza, kindly send us an inquiry at partymagicph@gmail.com.